The actor will not give in without a fight if he and his friend were to fall for the same girl. In I Will Never Let You Go <小女花不棄>, Vin Zhang (張彬彬) and Ariel Lin‘s (林依晨) characters are mutually in love, but he faces fierce competition from Lin Bo Hong‘s (林柏宏) character Dongfang Shi. In real life, Vin Zhang says he would not be the one to give up in a love triangle, but prefers a fair fight instead. 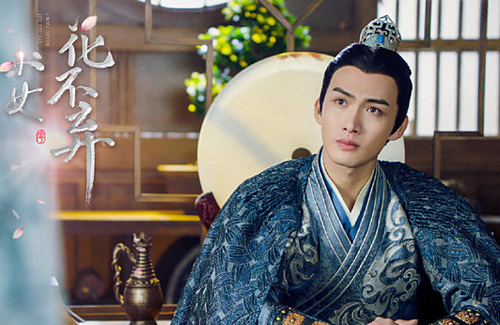 With his thick brows and tall, imposing stature, Vin’s participation in Eternal Love <三生三世十里桃花>, The King’s Woman <秦時麗人明月心> and other period dramas have earned him the nickname of “period drama specialist”. His collaboration this time with Taiwanese goddess Ariel Lin, along with his husky deep voice and sweet, handsome persona in the drama has won him legions of female fans in China as well as Taiwan. Taking on two characters in the drama, Vin has to switch from the ruffian Chen Yu to swordsman Knight Lotus within moments. He shared during the interview, saying “It is definitely a big challenge for an actor, so I decided to take on this show,” Analyzing his resemblance to his onscreen characters, he feels that he is more similar to Knight Lotus, as he is a man of few words with a strong sense of justice who prefers speaking through his actions, while the part of him which resembles Chen Yu is how they both speak harshly but has kind intentions, such as in the show where Chen Yu secretly protects Hua Buqi. While he and Lin Bo Hong fight each other intensely onscreen, Vin shared that the filming set is in fact cordial and happy. During their first desert scene together, they were so amused by each other’s intricate expressions and jealous moves that they had burst out laughing once the director shouted ‘cut’.